As a company committed to environmentally friendly processes, we actively keep and maintain several water recycling plants within service to allow us to use our water over and over again during the industrial production of our granite rough blocks, slabs, tiles and memorials. 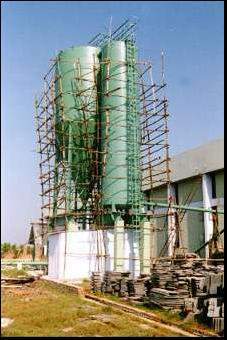 Here, the water recycling tower pictured to the left is under maintenance. Periodically the filters which this tower uses have to be cleaned and/or renewed to keep their efficiency at maximum. Long before environmental responsibility became a major global concern, protecting and respecting nature had always been an important ethos for our company directors and it continues today. Our management system measures and manages energy consumption, internal recycling, logistics, maintenance, microclimate, production processes, wastes and water recycling of the factory site. 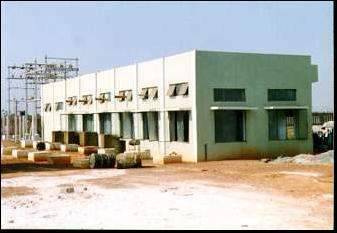 This image shows the external view of one of our main generating buildings which we use to create an uninterruptable supply of electricity for use in our factories. We have our own electricity generators since Indian weather conditions, especially at monsoon time during June to September, can often wipe out the local electric grid for days at a time thereby disrupting our production schedules. Here is an internal view of one of our large electricity generator buildings. 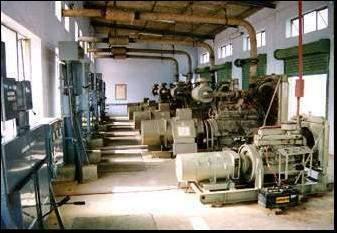 To allow our factory non-stop 24 hours a day production, these generators are permanently switched on. We thank you for reading through our granite tile factory production techniques section, we hope that this has given you an insight into the various activities we perform. Please use the navigation to view any other section of our web site.